4.9" x 4.9" stitched on 14 count. 3.8" x 3.8" stitched on 18 count. 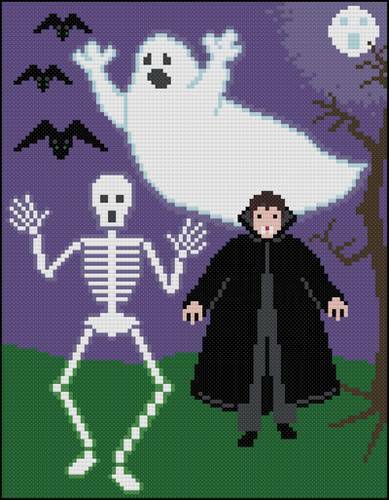 Visit from the Scream Team cross stitch pattern... This Halloween design features a ghost, a vampire, a skeleton, and bats coming to visit in the light of a full moon. DMC rayon floss or Kreinik Glow In The Dark braid may be used for enhancement.